I consider myself very fortunate to have a creative 3-year-old son. Fluent with letters of the alphabets since he was 2 years old, Philip uses a lot of methods to practice and express his letter-related skills. For example, while we wait for our orders at restaurants, we would use toothpicks to form letters and numbers. When we're not playing with the iPad, we also enjoy assembling Tetris-like puzzle blocks to practice the alphabets. Now, Philip is at the stage where he's starting to learn about sight words. He is able to form several everyday words using the tools lying around the house, including pencils, marker pens, magnetic alphabets (both physical ones and the iPad app) and puzzle blocks. He also has a new app to help him learn as well, called Tomo House. Tomo House is a fun app that teaches juniors to build letters and sight words. Tomo House is an interactive game that teaches juniors to form letters from uniquely shaped blocks and subsequently, create words using those letters. Instead of tracing or connecting dots, the app asks them to drag up to three wooden pieces to assemble letter ala a jigsaw puzzle. To assist them, there is a reasonable snap-to-grid ability for easily placing the pieces. What stands out for Philip and me is not the drag-n-drop gesture, but the tap to hammer action that you need to perform to construct the placed pieces into a complete letter. It's as if you are putting nails on the connectors and then securing them in place. This is a great concept to introduce to juniors and a really fun activity. The app currently has 50 everyday words that your juniors can play with grouped into 10 different categories, ranging from typical house elements such as desk and chair to airmail-related objects like stamp and mailbox. You start with a single word and unlock a new one when you have completed that word. 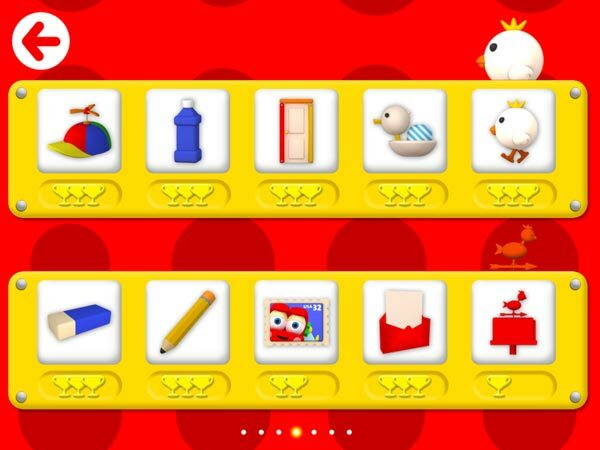 As you play the game, you will notice a timer on the top of the screen that slowly moves to the left, changing from the three-trophies zone to zero-trophy zone. This indicates that you should complete the challenge as soon as possible if you want to get more trophies. Depending on the learning stage where your juniors are currently at, they may choose to ignore this indicator and focus on getting the puzzles right or recognizing the word that they're building. The challenge itself doesn't end when the timer is up, so you can take all the time you need to finish a word. In fact, each time you put a wooden piece or hammer down a letter, the timer goes up a bit. This way, you can still gain a trophy or two even though you have reached the zero-trophy zone in the early stage of a challenge. As you unlock more words and explore into new categories, you will also see how the app adds new elements to expand the house. You can even interact with some of these elements and see animations that are accompanied by fun music and sound effects. After dragging the colorful wooden pieces to form a letter, juniors will delight in tapping on it to drive the nails in place. Tomo House allows you to choose a voice narrator with a British or an American accent. Both narrators are young boys, making the overall feel of the app suitable for its targeted age range. Switching from one accent to the other allows your juniors to learn that there is more than one way of saying the same words, especially if you and your juniors are not native English speakers. As you play with the app, it will uncover one object at a time, so you will be continually surprised. Sometimes, the app may also reveal objects that your juniors are not familiar with. This opens up an opportunity for you to discuss them with your juniors. Tomo House also has a musical activity page. I don't know why the developers decided to put it in, but it's a nice bonus for my juniors. This musical activity includes five colorful squares indicating the first five notes of an octave and three buttons that represent the sounds of a dog, a duckling, and a chick. One thing that you need to keep in mind is that the current version of the app (1.1) still has a few bugs in it. For example, you need to wait for a few seconds after completing a challenge before you can move on to the next word. If you don't wait until the pause button on the top left corner is enabled and the red house icon on the bottom is blinking, the app will either freeze or crash. But despite these bugs, I believe the app has a great learn-n-play value that it's worth playing to completion. The app contains 50 everyday words to learn. The first time Philip and I tried the app, we couldn't immediately figure out what we needed to to complete the challenge. We had dragged all the pieces required to form a letter but it didn't auto-complete itself. Then, the app showed a visual cue that we need to tap on the letter. So we did. To our surprise, the app showed an animated hammer to drive in the nails connecting the wooden pieces. Upon watching this, Philip jumped with excitement. We went on to play a few words until Philip got the hang of how things worked. Afterwards, I let him play on his own. When I opened the app for the second time a few days later, I was surprised to see that Philip had unlocked almost all 50 words. I figured that he must have loved the app a lot because all of these happened without my presence. I revisited the app again in the following few days and found that Philip had successfully completed it. Trust me, give this app to your juniors and let them try it out. They will love it. Also included is a musical activity to entertain your juniors. Tomo House is a nice app that both Philip and I enjoy very much. Its puzzle-like gameplay, word-building activity and selection of sight words are great, but its tap to hammer gesture is really addictive. I'd highly recommend this app for juniors aged 3+ who are starting to learn sight words. Get Tomo House on the App Store.